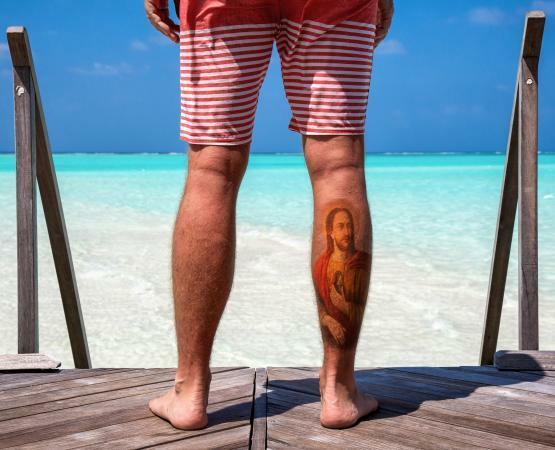 A St. Jude tattoo will cost you some real estate. The symbolism attached to this keeper-of-the-flame disciple is a feature of the tat and clear, visible detail requires some skin. St. Jude is often an emotional choice for a tattoo, acquired in the face of a serious life crisis. It can be the mark of the survivor. Jude is the traditional patron saint of hopeless cases, today recast as the bringer of hope and repairer of lost causes. His mission, in the earliest days of Christianity, was spreading the message of hope in the gospels of his teacher, Jesus Christ. He is portrayed holding an image of Christ's face, or a reliquary containing the image of Christ, next to his heart. Most St. Jude tattoos are black and white (gray-scale) illustrations, occasionally with a flame over the head symbolizing the presence at the Pentecost, the moment when the Holy Spirit descended on the Apostles after the Resurrection of Christ, imbuing them with the courage and grace to face down great difficulties and hold to a strong faith. St. Jude is a recognizable traditional saint with robes, long hair and a benevolent demeanor. To distinguish him from a Christ-figure and from other Apostles, typically his right hand holds a detailed Christ portrait or medallion and his left hand a large staff. It's hard to show that level of detail in a tiny tat. If you are planning a St. Jude tat, expect some serious ink. Calf - The back of the leg is a perfect canvas for full-length portraits. A St. Jude tat on your calf provides room for a halo of "light," a full view of the walking staff, a swirl of robes and an identifying saint's name in script. The upper arm and shoulder offers a similar space for the saint tat . It takes a skilled illustrator to capture perspective over body curves so look for an experienced portrait tattooist before committing to your ink. Chest - The front of the body, across the chest, is a favorite spot for a full St. Jude image. There is sufficient space for detail and the placement over the heart mirrors the way Jude holds the Christ-image at his heart level. Medallion - Another front-body possibility is a necklace tattoo made from a chain or rosary with a St. Jude medallion just focused on a 'bust" of the saint, a glimpse of his staff, and whatever detail can be clearly portrayed without muddying the image. This approach signals the value of a prayer to St. Jude, asking for intercession in a difficult situation. Neck or Ear - A smaller St. Jude is possible if the tattoo artist skips all but the essential details. Commandeering the real estate behind the ear and under the hairline provides a semi-flat surface that is exposed all the time, as long as the bearer's hair is cut short. It's a very visible expression of faith and could be a conversation starter. So beware of casual questions if you want your life events to remain private. In that case, a Jude who can be hidden by clothing is a better choice. The St. Jude Runs are relay and individual fundraising events for St. Jude Children's Research Hospital. Runners from Memphis to Peoria participate in a relay. Other sites include Champagne-Urbana, Chicago, Decatur, Springfield, St. Louis and more. To celebrate their participation and draw even more attention to the cause, some runners get an official race logo (large black running shoe prints alongside smaller running bare feet in red) tattooed around their ankle or up a calf. Some runners opt for a photo-image of a loved one treated at St. Jude as part of their tattoo. Others get a new logo tat every time they run the fundraising race. The tattoos signify membership in a club founded on personal crisis but fortified with the hope for cures and a future for young people diagnosed with a life-threatening disease. St. Jude Thaddeus (not to be confused with Judas Iscariot, the betrayer of Christ) was a cousin of Jesus and one of the original twelve Apostles. He came into his own after the crucifixion, an itinerant traveler preaching the gospel of Christ and expanding the early church at great personal risk. Jude is always depicted with an image of the head of Christ in his arms and a staff or walking stick. His known miracle was the curing of the King of Edessa of leprosy. Jesus sent Jude to the king with a cloth on which he'd left an impression of his face. When Jude delivered the cloth, the king's leprosy vanished. Jude was eventually tortured and killed for his faith. His remains are entombed with the other martyrs in a crypt under St. Peter's Basilica in Rome. Your St. Jude tattoo is a declaration that you meet life's setbacks with courage, optimism, and the faith that a powerful saint has your back. 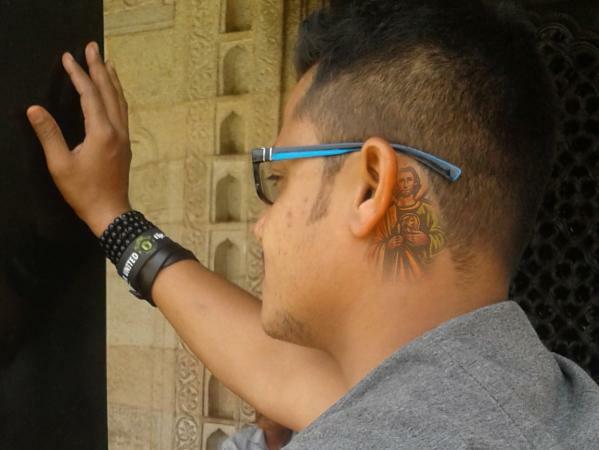 Whether that saint is on your back, or somewhere else on your skin, seeing the tattoo is a reminder of the mysteries and marvels of faith and the understanding that you expect your actions and choices - your insistence on hope - to affect your outcomes.